Often described as one of the toughest bike races in the lower 48 states, the Arrowhead 135 challenges even the most prepared riders. This is a journal by a non-athlete's participation in an event where starting is often just as much a challenge as finishing. Leaving in two days. In the grand scheme of adventures I've done, this doesn't seem like the craziest, or even maybe the hardest (I think the first Arrowhead will probably always occupy those slots), but it will still be a bigger adventure. Heading up to the middle of Canada with the Explorer for a his polar training course. 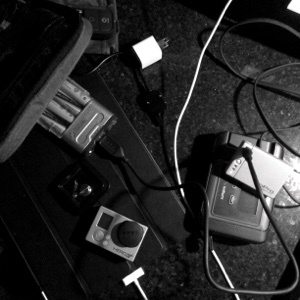 So tonight I'm charging all my stuff. I started by letting a battery pack charge with a solar panel all day. I want to know the actual capabilities of the solar panel. Then the sat phone, the basic communication tool. There is the Iridium Go which will be the satellite interface for data connections. An iPad, which can be easier to do blog composition and photo editing on than an iPhone. But an iPhone, too, that will be used for short messages and as a music player for the long days of skiing. There are two cameras - GoPro and DSLR - with two batteries each. A deLorme InReach unit as GPS and sat tracker/SMS. The necessary tools of a modern adventurer.